The opening of the London Homeless Memorial generated some negative press. However, I received a message through facebook that serves to remind me why we took this project on in the first place. I have redacted any identifying information. “Hello Abe, sorry to write you on facebook, but the UWO server appears to be down, and I am far too impatient to wait for that. My name is xxxxxxxx, and I am a former resident of London, but am currently living in xxxxxxxxx. 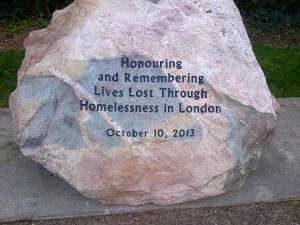 A friend of mine sent me the recent article about the unveiling of the monument dedicated to those who have lost their lives to homelessness in London. I’m sure you have received many messages of people telling you their stories and you know what you’ve done is good thing, but I wouldn’t be able to rest of I didn’t send you my own story and personally thank you. In 2005, a man’s lifeless body was found on a bench in xxxxxx Park. He was identified and my phone rang, and my life was forever changed. The man was my father, and after five years of life on the streets, my father succumbed to the toll it takes on your body (especially at 50, he died 5 days short of his 50th birthday). My dad being homeless was just something we accepted, and moved on with our lives. We still had a father/daughter relationship, still met for coffee, still played guitar in the park. He still loved me and let me know every chance he got, I was still “Daddy’s little girl”, and thought the world of him. Of course I worried about him daily and nightly, and of course I wanted to change his situation, but at 16, I felt helpless, and just learned to let my dad be who he wanted to be. My dad was bi-polar, and was in a very reclusive state, and I had lived through that before, I knew with every low there would be a high, I knew that after this down, he would come up again, it had to go up. I never, ever thought that my super hero dad, who proved time and again that he could do anything, would die homeless and alone on a bench. In the years following my dad’s death (it was just the 8th anniversary), I have felt a lot of resentment to anyone who would have passed him and spat negative remarks, or turned up their nose at him. I have felt guilt for not helping, as well as animosity towards the people of London for not helping. I know the programs in place in London are great, and I know that a lot is being done, but I continue to feel that my dad was left out. The recent monument that has been erected makes me feel like there are people that do know the tragedies that happen, the lives that are lost, people that care about those that have died alone. The monument is not just for those who are gone, but their family members that are still here, with the guilt and sadness felt for their deaths. My family couldn’t afford a tombstone for my dad’s burial, and I feel now, that with your help, my father has something that was put up in his memory, something put up with dignity and respect to honour a fallen superhero. I digress from my regular focus on homelessness and housing to rant just a little bit about the Canadian national anthem. You may have heard it being proposed to change the line “all thy sons command” to “in all of us command”. Much ink has been spilled and Rex Murphy got cute about it on the National, to invoke our patriotism and stop this travesty. I heard it expressed yesterday that this is just another silly feminist cause. But here’s the thing, “all thy sons command” isn’t even the original version. That line is a 1913 edit of the original “thou dost in us command”. Because that’s what we do with the anthem, we update it. What is being suggested now is that the update to use “sons” rather than something gender neutral (like the original) was less than ideal, and could use another tweak. Because the anthem is with us to stay, so will need tweaking as language evolves. As for “silly feminists”, what’s so silly about people thinking that your life trajectory and income-earning ability should not be determined by what’s under your underwear. Lots of people think that…you know, people like me. To me, the travesty is that Murphy and others use the term ‘feminist’ like the f-word, to disparage the efforts of those pushing for equity in our society. If these anthem traditionalists want to be so avoidant of change, why don’t they sing the original version? Because, of course, that would just be silly.